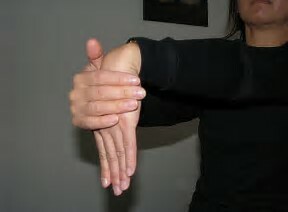 Stretch your Wrist Extensor Muscles! Working on a computer all day can leave the muscles of your hands and forearms overworked, tight and sore. Add in a hunched-forward shoulder posture and long hours without a break, and the stress on your wrist extensor muscles only increases. Perform this easy at-your-computer stretch during the day to give your hands a mini-break. 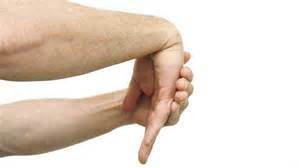 Extend your right arm forward so it is parallel to the floor, with your palm facing down. 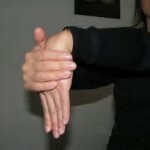 Gentle curl your fingers in and down feeling a subtle stretch in the top of your forearm. Hold for 10-30 seconds, then release. Repeat with your left arm forward.